What makes Chinese people so skinny? Is it all due to genes? A more active lifestyle? In her new book, Why the Chinese Don't Count Calories, British writer Lorraine Clissold set out to discover what it was that kept the Chinese so skinny when they were eating large, delicious meals, while she and her British and American counterparts were suffering on bland salads and still not managing to lose weight. Interviewed from her home in North Yorkshire, Clissold's ultimate answer for the secret to the slim Chinese physique is not surprising: the traditional Chinese diet, supported by a strong cultural background. Humorous and insightful, Why the Chinese Don't Count Calories is a thought-provoking analysis of what makes the Chinese diet work. Drawing on Clissold's 10 years in Beijing as a teacher of Chinese cooking and presenter of a cooking program on CCTV, it will likely have many readers re-examining their lifestyles and eating habits. Although it isn't your usual dieting book, it also includes tips and recipes for non-Chinese readers so they can incorporate some of the healthier aspects of Chinese diet into their lives. Clissold lays out several ideas for why the Chinese diet is so healthy, ranging from what is actually eaten to attitudes toward food. 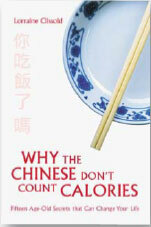 Why the Chinese Don't Count Calories is a thought-provoking analysis of the Chinese diet. 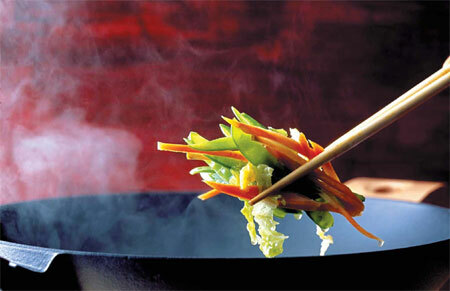 Vegetables play a much stronger role in Chinese cuisine than in a British or American one. Instead of being relegated to limp supporting roles, vegetables are much likely to be stars of the show, and appreciated on their own with meat used as a flavoring or side dish. Taking in liquid food also plays an important role. Chinese and Western ideas about soup are extremely different. Western soups are often hearty and sometimes even "a meal in its own right," but Chinese soups tend to be based on simple broths, providing a liquid element to the meal that is full of nutrients. "By drinking the liquid in which the vegetables are cooked, Chinese diners ensure that no vitamins are lost during the cooking process," she says. Clissold also believes that China has a much stronger culture of eating as an enjoyable communal activity, making every meal an occasion. She says that while she has always been fascinated by food, British attitudes toward food were often based on guilt over how many calories were consumed, and unhealthy cycles of guiltily eating rich meals only to punish herself by having a bland meal afterwards. "In China," she says, "I found myself surrounded by people who enjoyed eating, ate until they were full three times a day and never worried about getting fat or talked about cutting back to compensate after a good meal." One of the most intriguing parts of Why the Chinese Don't Count Calories is in Clissold's examination of how Chinese food culture is influenced by Taoist ideas about food and the body. "Chinese people have never doubted that what you eat is directly related to your state of health. They eat to nourish the whole body, rather than being concerned with just its outer shape, which is the case with many Western diet regimes," she says. She describes the need for balance in a diet, balancing out both yin and yang foods as well as the five flavors: sweet, pungent, salty, sour and bitter. Each flavor affects a different organ; for instance, sweet flavors affect the spleen and the stomach, while bitter flavors affect the heart and the small intestine. "The right amount of a flavor will benefit an organ; too much will put it out of kilter and damage the organ." she says. 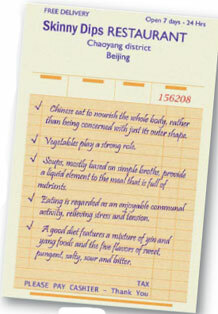 "A good Chinese diet will feature a mixture of yin and yang foods and the five flavors." Even a properly cooked, traditional Chinese meal will reflect this kind of balance, as no one flavor will overwhelm the others, or a bitter dish may balance out a sweeter one. Clissold believes that Westerners tend to overindulge in particular flavors in their diet, leading to bodies that Taoist food theory would consider unbalanced and dysfunctional. "Sweet (and bland) foods are the pre-dominant flavors in most Western diets, which is why many Western waistbands are stretched to the limit and digestive disorders are so common." She also compares the way that Chinese food is holistic with Western ideas of breaking down foods to their nutritional components, a notion that does not acknowledge that foods work in tandem with each other. "Modern nutritionists break a meal down into proteins, carbohydrates and fats," she says. "There is increasing awareness of the need for vitamins, minerals and micro nutrients but the Western nutrition model combined with the ready availability of food in the West tends to promote very limited eating." One surprising discovery that Clissold made during her research was that the Chinese actually consume 30 percent more calories than Westerners but stay 20 percent slimmer, a claim originally made by T. Colin Campbell in The China Study, a comprehensive survey that examined the link between diet and disease in China and other countries. The China Study debunked the idea that the Chinese are thinner because of a more active lifestyle and therefore consume more to maintain this lifestyle. In fact, to make its point, the survey compared the least active group of Chinese, office workers who led sedentary lives, with a more active group of average Americans who exercised moderately. But even as The China Study extolled the way that rural Chinese ate, one danger that Clissold sees is that as China modernizes, the Chinese themselves are moving away from their own traditional diets with their accumulated knowledge and falling into Western practices of eating on the run, snacking, buying processed foods and consuming empty calories, leading to the diseases of the industrialized world: cancer, diabetes and obesity. Still, she ends her book on an optimistic note about the role of foreign influences in Chinese cuisine, saying, "I have faith that the influence will not be long-term. Chinese culture has done a pretty good job of withstanding invasion to date."